Barrington Cellars is a small family owned and operated winery perched 500 feet east of Crooked Lake (Keuka) in the town of Barrington, Yates County, New York. 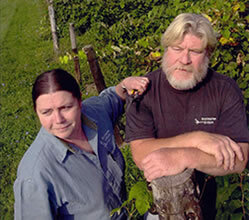 Since 1971 Ken and Eileen have been growing grapes and perfecting their wine making technique to bring the joy of affordable quality Labrusca (native), French-Hybrid, and Vinifera wines made from grapes grown here at Buzzard Crest Vineyards or from grapes of a few close neighbors. In 1997 we had 1200lbs of Niagara grapes "without a home"; we tried something new for us-ICE WINE. In late December we threw open the barn doors and froze the berries. Next day we pressed the frozen berries-the beginnings of our 1997 Gold Medal winner, "Niagara", at the New York State Fair. If you like fruity wines, you must stop to try our Niagara, Bliss, and Isabella Ice wines. Then in 2000 we had a bumper crop of Peaches and decided to try some Peach wine-just as Eileen's Grandfather, Fred Maring, made in East Irondequoit, NY many years ago. If sweet & peachy is your preference, do try the "Buzzard's Peach". Now we've added the "Buzzard's Pear" made with our own wild pears--sweet and subtle are the rule here. In the fall of 2004 we opened our new tasting and case storage facility just 500 feet up Gray Rd. The view is one of the most spectacular from the front porch overlooking Keuka Lake. Do STOP AND CHECK US OUT. Bring a picnic lunch to enjoy, if you're lucky the buzzards may fly by, too.